One day Brad Nickel, Richie Chimelis, and Maurice Lopes were discussing summer camps for our kids and how we wanted our children to go to a coding camp. We are all in the technology industry and we know how important it is for children today to learn and understand programming. The only coding camp in Miami was at a local university and they were charging $1,000 per week and we knew we could do better. So, we did extensive research on the best coding curriculums for kids. We looked at over 20 different courses and tested them out on our kids. We finally decided on 2 that were excellent and have been tested with millions of children. One of them is based on Minecraft and the other lets kids build their own games. 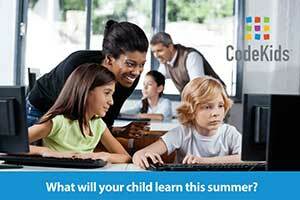 Both are excellent at guiding children through the fundamentals of programming and both will provide value to your children long after they leave CodeKids Camp. Previous Going away from Miami this Summer?? Save up to $5000 during your trip.